Since most critics' judgment can't be trusted, now it's my turn. High up on the typical list of complaints about the Star Wars prequels is that they were saddled by the amount of boring, verbose politics in them. Nevertheless, they were essential to the telling of the story, which was always going to be twofold: first, the story of how Anakin Skywalker became Darth Vader; and second, how the peaceful Republic fell and the Evil Empire rose. That second story, detailing the end of one political system and the beginning of another, was arguably more important to the overarching story of Star Wars. The problem isn't that there was politics. The problem is that, like most of the other elements of the story, the politics were clearly written backwards from the events of Episode IV, and made so that all things lined up to lead to that conclusion. The execution of this, besides being clunky, was also unfortunately laden with problems of logic and rationale. In this post I will attempt to illustrate the largest problems with the politics in the Star Wars prequels. For the purpose of this post, I am disregarding any supplementary, "expanded universe" sources that might explain some of the politics that are not spelled out in the films. As always, if it's not in the films, it is not explained to the audience. To begin, let's simply remind ourselves of what the major political plot points were in the prequels. First, every revolved around the political machinations of Senator/Chancellor Palpatine/Darth Sidious, and the story of the fall of the Republic is the same story as the rise of Emperor Palpatine. In Episode I, Palpatine is the Senator from Naboo, and as Darth Sidious engineers a crisis between the Naboo and the Trade Federation. This allows him to be elected Chancellor after a no-confidence vote in Chancellor Valorum. Meanwhile the Naboo defeat the Trade Federation in battle. 10 years later, Palpatine is still Chancellor, and Amidala is now Senator. Separatists begin leaving the Republic and the threat of war is in the air. The Senate debates the creation of an army, which Amidala opposes, but the threat of assassination forces her to go into hiding. Palpatine manipulates Jar Jar Binks, who serves in her stead, into proposing that the Senate give Palpatine the emergency powers he needs to create an army, which is then sent against the armies of the Separatists, beginning the Clone Wars. With the wars dragging on, and the Separatist leaders elusive, Palpatine holds onto his emergency powers until confronted by the Jedi. After fighting them back and ordering the Separatist leaders killed, Palpatine announces the treason of the Jedi to the Senate and declares himself head of the Empire. The problem with this is not that Palpatine successfully accomplishes all of this against all odds, under the nose of characters that should see it coming. After all, history is replete with examples of men rising to power by similar means. The problem is that the levers of power that he pulls would often seem to accomplish the opposite of what he intends to do, and yet things tend to fall into place despite this. Case in point, the inciting incident in Episode I: the Trade Federation blockade of Naboo. Despite the opening crawl and ensuing plot, not much is explained about the motives of the Trade Federation. It is obvious that Darth Sidious has employed the Trade Federation to do his bidding, but it can also be assumed that blockading the planet would also directly benefit the Trade Federation in some way anyway, or else they would have nothing to show for their actions in the end. So what were they after? According to the film, the crisis began with taxation that originated in the Senate. If that's the case, what issue does the Trade Federation have with Naboo? Assuming that the Trade Federation is against taxation because it would hurt their profits, then they really should be pursuing their agenda in the Senate to end the taxation. Instead they surround the planet of Naboo with their war ships. Are they trying to circumvent the taxes by forcing the Naboo to sign a treaty that would do just that? If so, wouldn't they need to do the same with every planet they do trade with? And even if that were the case, any contract that they sign would be in violation of the law, bringing both parties into conflict with the Senate anyway. Meanwhile, Queen Amidala escapes to present her case directly to the Senate. As Senator Palpatine explains, the corruption in the Senate blocks Chancellor Valorum from taking any action. Whether or not the Chancellor is willing to do anything, I would assume that as a democratic body the members of the Senate should be able to enact action through a majority vote, which they actually do by invoking a vote of no-confidence in the Chancellor. This begs the question: if the Senate had the votes to remove the Chancellor from office due to his inaction, shouldn't they have had the votes to respond to Queen Amidala's call for help? It seems that Amidala had the support of the Senate anyway. This would have eliminated Palpatine's opportunity to seize the Chancellorship. But for whatever reason Chancellor Valorum is removed from office and Palpatine is among the nominees to succeed him. Why is that? Part of the reason for removing Valorum from office was because he was biased by too much influence, which caused him to side with the Trade Federation. Presumably the best choice for Chancellor would be someone that is unbiased and able to judge issues on their merits. Instead, Palpatine is elected, despite the fact that as the representative of one of the warring parties, any actions of his would clearly be in favor of Naboo. If a majority of the Senate elected him Chancellor, knowing he would rule in Naboo's favor, why wouldn't they just skip the election of a new Chancellor and just take action to help Naboo? Despite the fact that Queen Amidala's own Senator has a strong chance of being elected Chancellor and resolving the crisis, she chooses to return to Naboo, encourages the Gungans to fight on her behalf, and defeats the Trade Federation. This renders the election of Palpatine moot. With the Trade Federation is evicted from the planet, who the Chancellor of the Senate is makes little difference to the situation. In addition, by abandoning the political process prematurely, the Queen's actions seem inpatient and needlessly brash, and by convincing the Gungans to fight for her people's freedom she pointlessly lets hundreds of them die over a matter that was a few votes away from resolving. Given her anti-war position in this film and the next ones, this seems entirely out of character. Another thing: the idea that Palpatine is the elected Senator from Naboo is highly questionable. Was he born and raised there? While the idea that an evil person could come from such a small, peaceful place is not totally out of the question, in this case it seems highly improbable. Naboo is modeled after Venice, and as such seems remote and unconcerned with the machinations of the rest of the galaxy. It just seems bizarre that such an idyllic location would be the origin of the galaxy's most ambitious and evil villain. 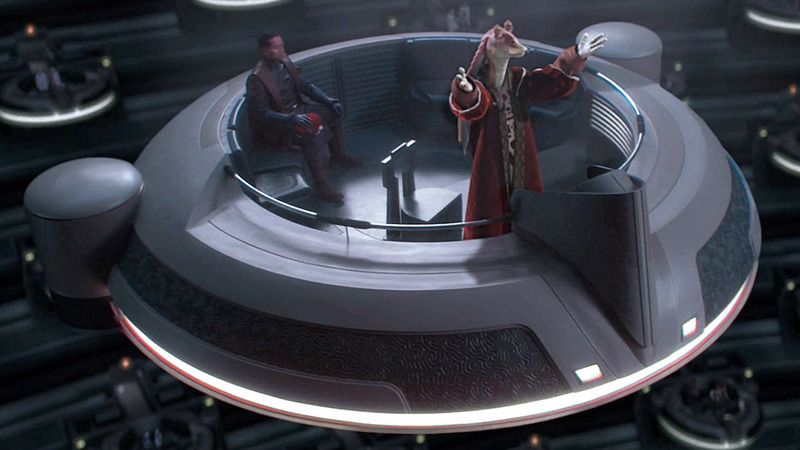 Alright, so by being elected Chancellor, Palpatine should have no interest in the resolution of the crisis on Naboo. I suppose he would hang on to the Viceroy of the Trade Federation as long as he was useful, but after the Battle of Naboo, what would the Viceroy have to gain from serving him? In Episode II, he seems fixated on assassinating Amidala purely out of revenge. While that motive is not entirely beyond belief, by this point in the trilogy the Viceroy has pooled his Trade Federation troops together with the rest of the Separatist members and seems to be preparing for war. Amidala, meanwhile has become Senator and has been working to oppose the Military Creation Act, which would create an army for the Republic. So why would the Viceroy want to assassinate the one person who could prevent the Republic from raising an army that would oppose him in battle? Why indeed would Amidala be against creating an army, besides the obvious appeal to liberal sensibilities against fighting? After all, by resolving the crisis on Naboo with arms, she of all people should understand the benefits to responding to threats with a military. Instead for no apparent reason, she is against resisting the Trade Federation and Separatists with an army, and again the Senate is blocked from action because of opposition. The assassination attempts against Amidala's life seem to be a clear indication that someone is trying to silence her opposition, which leads to the plot of Episode II of the Jedi's unraveling of who her assassin is. Bowing to pressure, Amidala agrees to retreat to Naboo to avoid her attacker, but instead of having one of the seemingly endless numbers of decoys stand in for her, so as not to alert her attackers to her absence (Rose Byrne could have done the job), she instead appoints Jar Jar Binks to represent her in the Senate. So, as far as she knows, her attacker should notice her disappearance, and would presumably look for her on her home planet (luckily for her, they don't seem to try). This is where Jar Jar Binks is manipulated into voting the Chancellor emergency powers. Now, it's well established that Jar Jar is an idiot, but so far in the films he's just been depicted as annoying, clumsy, and goofy. But still, he should have the ability to reason. So when the film tells us that he's been under Amidala's employ, and stressing the point that she has spent the entire last year fighting back the creation of an army, you would assume that Jar Jar is fairly familiar with her position. Yet, at a crucial moment when it's discussed that the Chancellor can authorize the army's creation if he is given emergency powers, Jar Jar is swayed into proposing them based on the suggestion that Amidala would have done so, despite it being the exact opposite of her position. It would be as if Obama was incapacitated for a day, and as acting president someone said to Joe Biden, "If only Barack Obama were here, he would have the courage to repeal Obamacare." And then, based on that one sentence, Joe Biden were to go, "You know, you're right. I'll do it for him!" I mean, Jar Jar is goofy, but even a complete idiot would know not to do the exact opposite of what was expected of him. If he were, then Amidala is pretty stupid to have given him that power in the first place. And again, we have to ask, if there were enough votes to give Chancellor Palpatine emergency powers, wouldn't there have been enough votes to just create the army? Both votes accomplish the same thing, only if anything it should take more votes to grant one person such sweeping powers. Even if the creation of the army was somehow blocked because of Amidala, her absence should now allow a normal vote to take place. So again, Palpatine's rise is possible because of politics that make absolutely no sense. Years later, Palpatine still has his emergency powers and remains in office beyond his normal term because the Clone Wars still rage on, and as long as they do he can expect to continue to do so. As secret leader of the Secessionists, he is in a position to know exactly where to position all his forces to stretch the war into eternity, cementing his grip on power. Yet by the middle of Episode III, Palpatine gives away the positions of all the Separatist leaders and brings the war to an end, and in doing so brings to an end any excuse to stay in power. Then, he reveals the Jedi attempt on his life and declares himself ruler in perpetuity. Even if the Senate were to condone his campaign against the Jedi, it seems that they would still ask him to give up his emergency powers since the war is over. We don't even know when the Rebellion begins; it could be years from then. Would the Senate really allow Palpatine emergency powers during a time of peace? So, in sum, Palpatine began his career on a planet that should never have produced an evil warmonger; he was elected to Chancellor despite being too biased to serve in that position thanks to more votes being cast for him than there were cast to just resolve the crisis; he was then granted emergency powers by the one representative that shouldn't have wanted to, with more votes than there were to just create the army and resolve the crisis; and then he cemented his grip on power by ending the war that justified his grip on power. Of course, this can all be explained by Palpatine using force influence to induce the entire body of the Senate into doing these unexplainable things. But if that's the case, there is no drama. The entire Prequel Trilogy is basically one long deus ex machina. So while politics in Star Wars could have been effective, they were instead muddled by multiple plot holes and lapses in logic. Had they been better written, the politics could have been a major strength in the story.